Note: This workshop will be held in Dutch! ‘’How to change within an organization?’’ BOOM tackles this question by demonstrating us the different approaches of companies when it comes to change. Using practical examples, BOOM will elaborate on the factors behind success and its challenges. Which phases will a company go through? And which challenges will a company face? Why is change difficult and what role does culture have when it comes to change? How can you contribute to the changing process within a company? The workshop will take place on the 16th of April from 12:45 until 14:30. 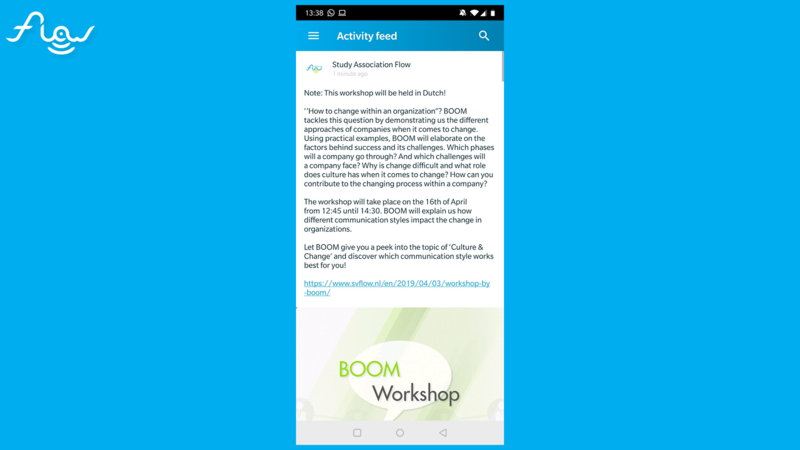 BOOM will explain us how different communication styles impact the change in organizations. Let BOOM give you a peek into the topic of ‘Culture & Change’ and discover which communication style works best for you! Note: Non-members pay €2,50 at the door.